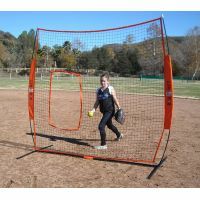 7x7 foot softball pitching screen. Can be use with live pitching or a pitching machine. Shipping 18.00 lower 48 states. 35 to AK and HI. Extremely portable pitching screen. Sets up in about 2 minutes with just one old coach. This net fits on the Bownet Bigmouth Frame. Frame sold seperately.